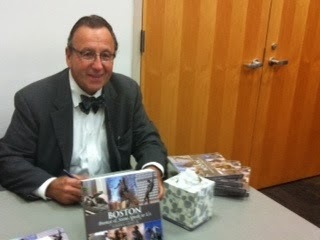 Thank you from "Boston Bronze and Stone Speak To Us"
With much gratitude I would like to thank everyone who has supported me with my book, "Boston Bronze and Stone Speak To Us". This past autumn semester has been extremely hectic with my book promotion and public speaking engagements. The Boston Public Libraries and surrounding suburban libraries have been supportive of the historical and artistic significance of our Boston Monuments. The Women's Clubs, Rotary Clubs, Public Schools, The State House Staff, The Beacon Hill Seminars, The Brookline Adult Education Program and the University of Massachusetts Campus at Columbia Point Boston have all been supportive. I am grateful, honored and humbled that so many have expressed to me not only how beautiful my book is but also how useful it has been for them when further understanding the significance of our Boston Monuments. Each one of the people associated with these institutional groups has felt the artist's ideas, feelings as well as emotions embedded within each of our Boston's sculptures. More monuments have and are still being created by our American sculptors for our newly recognized leaders and most recent historical events. Our monuments speak to us in many ways. The diversity and expanse of age of the people in my audiences impressed me at the conclusion of each talk. I wish all of you a happy holiday season. This bronze statue of John F. Kennedy, the 35th President of the United States. Dedicated on May 29, 1990, was designed and sculpted by Isabel McIlvain and paid for by the contributions of pri- vate citizens. John Fitzgerald Kennedy, also referred to as John F. Kennedy, JFK, John Kennedy or Jack Kennedy, was the 35th President of the United States. In 1960 he became the youngest man ever elected president of the United States. He served from 1961 until his assassination in 1963. Kennedy represented the state of Massachusetts from 1947 to 1960, first as a member of the U.S. House of Representatives, and then, in the U.S. Senate. Kennedy, the Democratic candidate, was elected President of the United States in 1960, at age 43, against Republican candidate Richard Nixon in one of the closest elections in American history at that time. He was assassinated on November 22, 1963. "Boston Bronze and Stone Speak To Us"can be purchased at Bestsellers Bookstore Cafe, Medford, Ma, Old North Church, USS Constitution Museum, Amazon.com. Barnes & Noble Book Stores. Dimitri Hadzi sculpture " Omphalos "saved by independent Realestate redeveloper. Michael Rauseo, a Rockport, MA redeveloper, saves Dimitri Hadzi's sculpture entitled "Omphalos"from Harvard Square Cambridge to Pigeon Cove, Rockport. Cambridge and Boston once a center for manufacturing building tools was immortalized by Hadzi with this 20 ft white & red granite monument. Now, this same sculpture will be recycled to immortalize the once productive Cape Ann Tool Company of Rockport, MA. Dimitri Hadzi, also created the "Thermopylae" monument in Boston's Government Center, immortalizing two great historical events. One, the Greek Battle of Thermopylae the heroic battle of the few against the many. Two, John F. Kennedy's book, "Profiles in Courage"a study in leadership bravery. Our sincere thanks to a brave redeveloper , Mr Rauseo. John F. Paramino & The North Bennet Street School, North End. 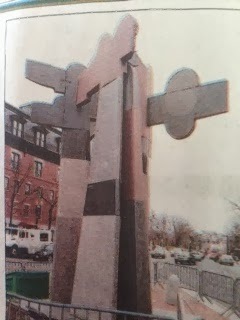 Numerous Boston Bronze and Stone Sculptures have been produced by John Francis Paramino in Boston. Just to name a few: on Boston Common John Barry, Marquis de La Fayette, The Founders Monument, The Declaration of Independence and on the Fenway; The World War II monument. Paramino like so many hundreds of graduates from The North Bennet Street School in the North End have been members of a very special talented alumni in our City of Boston. The North Bennet Street School is America's first Trade School, founded in 1881, specializing in Piano building & tuning, violin construction , watch and jewelry repair and design, and carpentry trades. Paramino graduated from this school and did further study of design in sculpture working with bronze and stone mediums under the direction of Bela Lyon Pratt creator of "Art and Science "monuments guarding the original entrance of our Boston Public Library. John also took instruction from another world class sculptor, August Saint Gaudens sculptor of "Robert Gould Shaw"monument on Boston Common. Well wishes to the staff at the New North Bennet Street School location on North Street, North End. Boston, always the leader, built this WWII Monument before our now iconic National WWII memorial in Washington, D.C. This granite ellipse with a winged victory commemorates Boston’s World War II dead. Boston native John Paramino attended North Bennett Street Industrial School; later he was a pupil of Bela Pratt and assisted both Pratt and Saint-Gaudens. Beginning as a designer of commemorative medals and plaques, Paramino cornered the market on plaque production in Boston under Mayor Curley. In 1931 he was accused by a city councilor of running a monopoly and of charging twice the going rate, but his supporters defended him successfully. Many of the city’s bronze historical markers are signed with his name. Declaration of Independence Monument, The Lafayette Mall Monument, The Commodore John Barry Monument, The Founders Memorial, The Second Church Plaque just to mention a few of his works. Boston Bronze and Stone Speaks To Us, can be purchsed at Amazon.com and Barns & Noble Bookstores,Old North Church Gift Shop, Bestsellers Cafe Bookstore, etc..